The county of Los Angeles and the State of California have a waste management program that puts a huge number of garbage trucks into the business lots and residential neighborhoods we all live and work within. These large trash trucks come into regular contact with pedestrians, bicyclists, and other motor vehicles on a daily basis. According to the Federal Motor Carrier Safety Administration (FMCSA), “Approximately 60 percent of all fatal crashes involving large trucks occurred on rural roads and 25 percent on rural or urban Interstate highways” in 2015.1 The public cannot easily avoid interacting with garbage collection vehicles — we need their services, and they thrive on our business. But when something goes wrong, the injuries sustained by victims are often catastrophic and life-threatening. If you have been injured in an accident or incident with a garbage truck, we urge you to become familiar with your rights. The Law Offices of David Azizi have been serving clients injured in truck and car accidents for nearly 20 years and are standing by to provide a free review of your case. Chat or call 800-991-5292 to begin your accident evaluation today. What Kind of Vehicle Is A Garbage Truck? A garbage truck, sometimes referred to as a trash truck, waste collection vehicle or refuse collection vehicle, is part of the larger family of commercial vehicles, heavy trucks, and heavy equipment used to collect and haul out waste to a landfill or processing center. Most use a form of hydraulic lift or robotic arm, though some use workers to pick up and dump curbside bins. Neighborhoods in Los Angeles, Orange County and throughout the state have seen a rise in the number of trucks and services that now use different bins, and in many cases, different trucks to collect the waste in those bins. In addition to these residential containers, the City of Los Angeles also maintains 1,000 wire bins for different waste products. In both the public and private spaces throughout our cities, encounters with garbage trucks are a certainty. 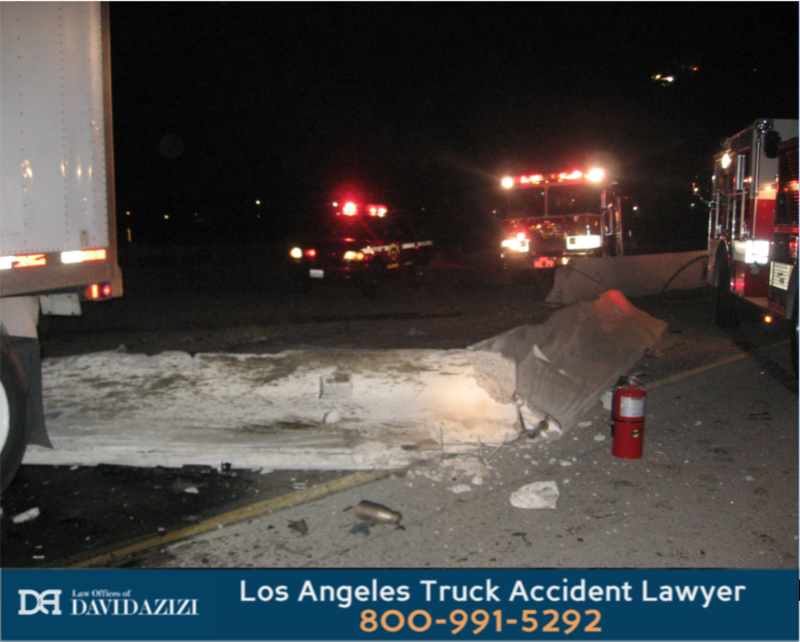 Truck Freeway Accident Causing Brain Injury Lawsuit - $4.95 Million Settled"Law Offices of David Azizi - 1-800-991-5292 https://www.azizilawfirm.com/truck-accident-lawyer Truck Freeway Accident Causing Brain Injury Lawsuit - $4.95 Million Settled In this case in which a client had come to a stop behind another big rig. Another 18 wheeler came up behind the client. Unfortunately, the 18 wheeler that was coming from behind the driver did not shift down or use his breaks to slow down. It was too late and there was a huge pile up as several big rigs behind that one piled on. There were brain injuries sustained from the case." Technology is now providing a larger variety of garbage trucks. These are becoming more and more automated, requiring fewer drivers, and are expected to eventually become completely driverless and computer operated. Side Loader Garbage Trucks – These popular, mostly residential trucks can do pickups for close to 1,500 homes per day and only require a single operator. The most noticeable feature is a robotic arm that fits a specific city-issued container for waste identified by the color of the bin. Roll Off Garbage Trucks – Sometimes seen in front of a residence where construction is occurring or a large dump of waste has been requested. These are massive bins that are dropped curbside, filled, and then carted away when the truck returns to pick up the filled bin, using a hydraulic lift. Anytime a large and powerful vehicle comes into proximity with pedestrians, motorcycles, cars, SUV’s or bicyclists, dangers are prevalent, especially considering that California allows a maximum weight of 80,000 pounds for 18-wheelers, commercial vehicles and dump trucks. Smaller vehicles and people, especially including children who often have a fascination with these loud giants, stand little chance against these beasts of the road. 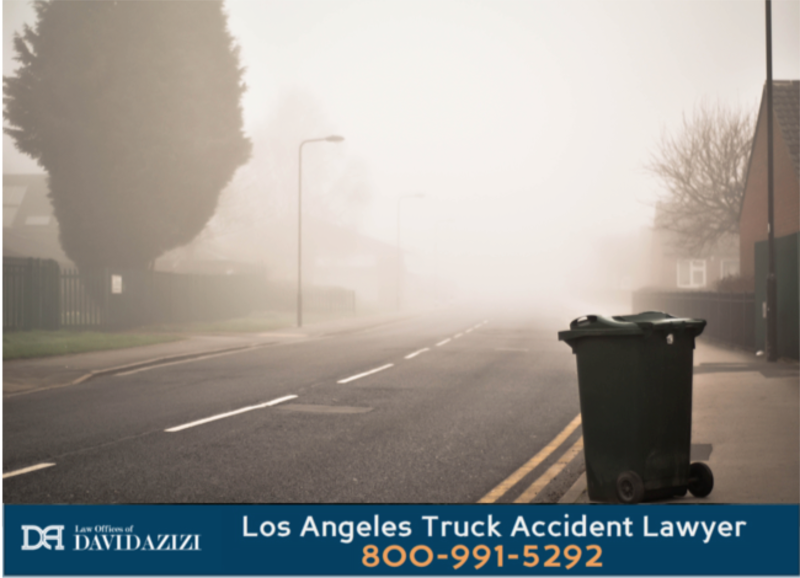 California truck accident attorney David Azizi shares the most important legal and safety steps after a truck crash in the audio podcast below. 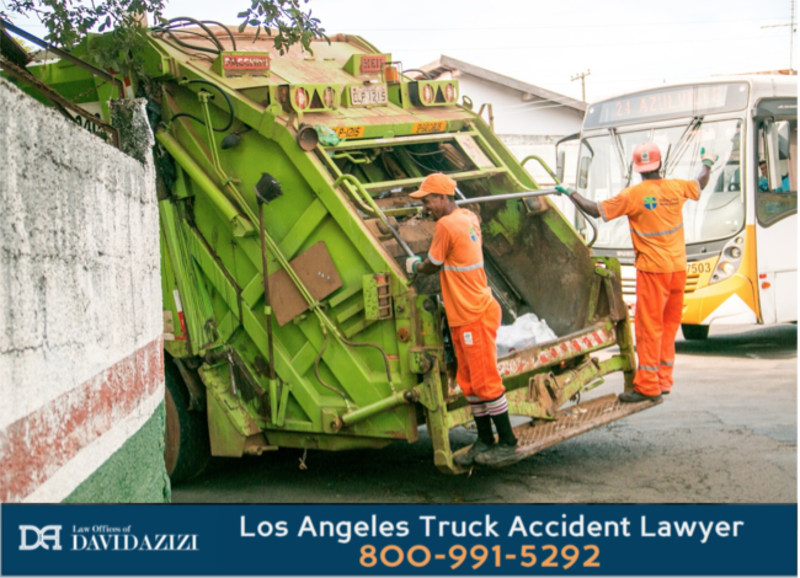 In nearly all of the garbage truck injury cases a Los Angeles truck accident attorney reviews and takes on, the most popular claims usually involve some form of negligence on the part of the driver and/or the company or entity that owns the vehicle and contracts the driver. All drivers of large commercial vehicles and trucks, including trash trucks, are required by law to receive additional training, pass exams, and earn a Commercial Driver’s License (CDL). This means that all parties involved, and most certainly the truck drivers themselves, have agreed to operate by a higher standard, more rigorous rules and codes, and a work ethic that goes beyond a standard passenger vehicle driver’s license. When a garbage truck driver or operator fails to live up to these higher legal standards, regulations, and laws, that means they have acted with negligence — they had a duty, they failed to do it. When that happens, people get hurt or killed. Poor vehicle maintenance resulting in an accident with injuries or wrongful death. Accidents caused by driver fatigue or lack of sleep – This has been a real issue in Los Angeles, where a fight to allow garbage truck drivers to nap on breaks brought on a $26 million settlement for garbage truck drivers paid by L.A. Defective equipment that should not have passed inspection. This issue came to light in a garbage truck accident that killed two children in Los Angeles because of a defective rod protruding from the truck. Ignoring truck blind spots – This led to a $10 million lawsuit for a woman in Northridge who was very badly injured when a trash truck struck her while in a crosswalk. The injuries resulting from a garbage truck accident are often catastrophic for victims. In these cases, the driver and company are in the wrong, and should be held liable to pay for the damage they have created. Winning that financial compensation and justice for California families is what a solid garbage truck accident lawyer in Los Angeles will know how to achieve for these injured victims. Our garbage truck crash team fights to collect all of these money damages, including compensation for a destroyed vehicle, for our clients. Your health, justice, and financial well being are our top priorities for the injured victims we serve. Who Can Be Sued After a Garbage Truck Accident? In the State of California, and particularly in Los Angeles County, single-family home and small apartment residents have their garbage services operated by the L.A. Bureau of Sanitation. When an accident occurs, legal action can be initiated against the driver, and in some cases, the government. For restaurants, hotels and other commercial entities, partnerships with private companies are more common. In these circumstances, a lawsuit may be filed against the truck driver, and the company that contracts them. Government contracts with private truck companies are now more common for commercial trash pickup with the passing of the Zero Waste L.A. Program. These new government franchised waste companies can sometimes be thought of as private entities, and other times as part of the government. Bottom line, a garbage truck accident lawyer must be educated in knowing which parties are liable after an accident with a trash truck. The Law Offices of David Azizi have been serving injured clients for nearly 20 years, with a 98 percent success rate. That directly translates into justice and financial compensation for clients injured by a garbage truck or other commercial vehicle. We will review your injury claim for free when you chat or call us at 800-991-5292. David and the garbage truck accident team will fight your case on a contingency fee basis — the popular “no win, no payment” structure that allows us to take on your expenses for investigation, legal fees and beyond. You will not pay us unless we win your case, and even then, our payment comes out of the money collected from the responsible parties. Keep in mind that deadlines are very important with lawsuits. The statute of limitations in California for truck accident cases can be as short as six months when taking legal action against the government, and up to two years with private truckers and companies. We are ready to hear your important story and begin fighting for your important cause. Call or chat with us today and let’s get your free case review underway.